Though ACU Blogs has seen several additions over the holiday break, much of the work by Web Integration and Programming focused on server updates to keep WordPress blogs humming along. Since our launch in 2009, faculty and staff at ACU have created more than 1,000 blogs and those numbers will continue to grow in 2011. One important holiday update improved the Google Class Calendar system in a several key ways. Most importantly, faculty can now edit every event on a class calendar from one screen (see part #2 of the podcast below). The following three-part podcast walks you through 3 ways to get course calendars into your WordPress blog. We’ll start with the easy stuff, but if you already have a reading schedule typed up at the end of your syllabus, copy and paste may be all you need. One tool that will make working with Google Class Calendars much easier this spring is the new calendar editing tool in MyACU. The new plugin that really brings your Google Calendar into your blog is ICS Calendar. This podcast breaks the process of embedding a calendar into your blog down into easy to follow steps. Here are a few of the other plugins and projects that were tested and installed over the break. Please continue to send along suggestions for future updates. FeedWordPress is a plugin that brings in content from any blog with an RSS feed and aggregates it on a single blog (see example at Feminist Blogs hub). Colleagues at the University of Mary Washington have been using it to create “mother blogs” where students each create their own blogs but share their feeds back to a central class blog that consolidates dozens of external discussions. WP LaTeX is a plugin to help get math formulas and equations into blog posts and comments. Here are a couple examples to see how LaTeX turns code into formulas presented as small images. 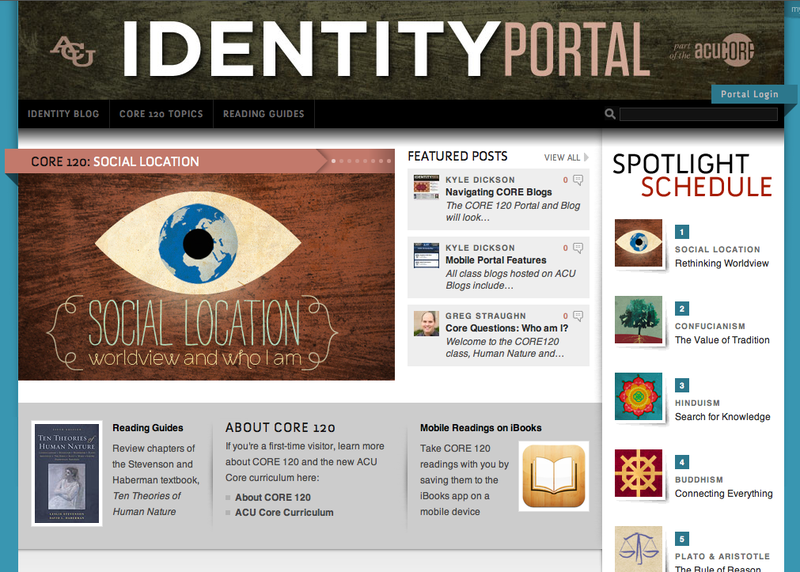 Finally, this is less a plugin than a plug, but Greg Straughn and Nil Santana worked long hours over the break to adapt the main Cornerstone Portal theme developed last summer by Mike Wiggins for use in the next CORE class coming online to produce the CORE 120: Identity Portal. Both versions of the theme demonstrate the flexibility of WordPress to solve complex web publishing challenges within the university. 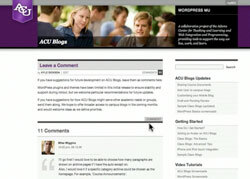 Many students and faculty have asked for help introducing ACU Blogs, specifically post by email, to new users. Here are a couple short introductions from staff in the Digital Media Center that should help serve this need. Feel free to leave comments to this thread if there are other intros you’d like added to this list, specifically to serve student users. Thanks for your help. *NOTE: The Post by Email function on any class blog is an option selected by some faculty, but this plugin is turned off by default. For faculty interested in the feature, here is the faculty introduction. 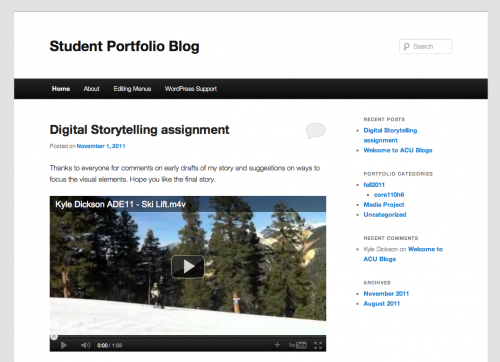 The past few weeks campus developers have been testing updates to WordPress MU that will go live Friday. 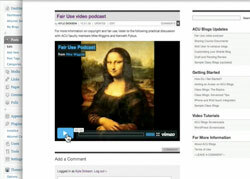 For a quick summary of new plugins and capabilities, see the following four-part podcast. 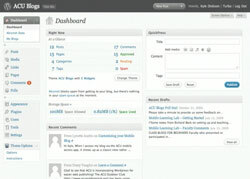 A quick introduction to the mid-semester updates and two additions to your Dashboard. Simple video embedding is now available through shortcodes for over 50 popular video services. For a complete list of available services and example shortcodes, visit the WordPress Video Plugin site. Those looking for ways to add embedded polls to blog posts will also be interested in this update. To create your free account, visit the PollDaddy site (you’ll need this login before creating your first poll). Finally, to improve the speed of the Post by Email system, there is one last change. If you are using Postie to post content to your blog, you’ll need to Activate the plugin. For more information on using Postie, see the Post by Email screencast. For all other questions or comments about the update, please post to the Leave a Comment page. Here is a quick walk-through of three ways to share files on a class blog. The process will be the same whether you’re sharing a Word document, PowerPoint presentation, PDF, or media file. Feel free to raise additional questions or issues in the comments below. The three methods described are posting documents by email, using the Add Media button in the editor window, or converting Word documents to pages using the Paste from Word button. *Remember that mobile users also have the ability to open most common file types from an iPhone or iPod touch. Unfortunately Flash files or media are not currently compatible with the iPhone software though links to the following formats can be opened from your blog. Mike Wiggins put together a couple new screencasts that may help new WordPress users working with the text editor and adding images to their blog. The following screencast will introduce you to Postie, the WordPress plugin that handles post by email, along with the main settings that give you more control over who can (and can’t) use the class blog email address. Go to the Media settings panel (above Postie in the left menu) and replace the Large size values with 490 for Max Width and Max Height. Send an email to your class blog with one or two images attached. Images wider than the main column should now be reduced as well as being linked to the original full-size image. Let me know if you have any other questions about post by email. Our friend Mike Wiggins has taken time he didn’t have the week before classes start to make life easier for new blog owners. He is the designer of our ACU Blogs theme and has put together two screencasts introducing the first-time setup and use of a custom widget he designed for your sidebar. In the coming weeks, we’ll be spotlighting additional features like post by email or the mobile interface in follow-up screencasts. Thanks again to Mike for his help.